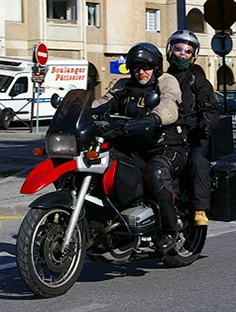 Sweden: SMC (Sveriges MotorCyklister) the Swedish motorcyclists association have stated that they are convinced that this summer’s low death toll in motorcycle accidents could have been even lower if the design of the road environment was not so deadly for riders – vulnerable road users. The proportion of motorcyclists killed in guard rail accidents is the highest ever, not only in Sweden but is also higher in comparison to international comparison proportions. An in-depth study by the Swedish Transport Administration of single-vehicle fatalities found that every third motorcyclist was killed in a collision was with a post or railing. SMC say that there may several reasons for this. They speculate that more and more roads are fitted with centre and side rails which increase the risk of injury to motorcyclists. There is no requirement that the rails used are safe for other road users other than those traveling in cars. Structurally the barriers may be very close to the road, with side rails replacing forgiving roadside areas, i.e. ditches without poles, stones and/or other solid objects. Five out of six fatal accidents this year occurred on the TENT-roads with the highest safety demands and thus also higher speed limits (100-120 km/h). At the same time this is where most fatal motorcycle accidents occur. In the last six years, 15 out of 25 fatal motorcycle accidents where the rider crashed into a barrier happened on a TENT-road. SMC calls for a new way of thinking: Smoother median and side barriers without unprotected poles are needed. The barriers must be installed further away from the road than what is allowed today. It is obvious that a forgiving roadside should be used where it is possible, instead of side barriers. SMC presumes that the high share of fatal motorcycle accidents with barriers, and the high amount on the TENT-roads, is an alarm bell to all road operators. According to the calculation model of the Swedish Transport Administration, the cost to society for killed and severely injured motorcyclists in crash barrier accidents during the last six years has passed one billion Swedish kronas* (1,255,275,000). Swedish society would save not only lives and life long suffering, but also money with another way of planning and building the road environment. We are aware that 5.5 billion Swedish kronas are budgeted in order to install more barriers on Swedish roads in the coming years. We can only hope that this amount is spent wisely and that safer barriers are used and installed where they do not pose a danger to the lives of motorcyclists. * 1 Euro = 9,23 SEK. 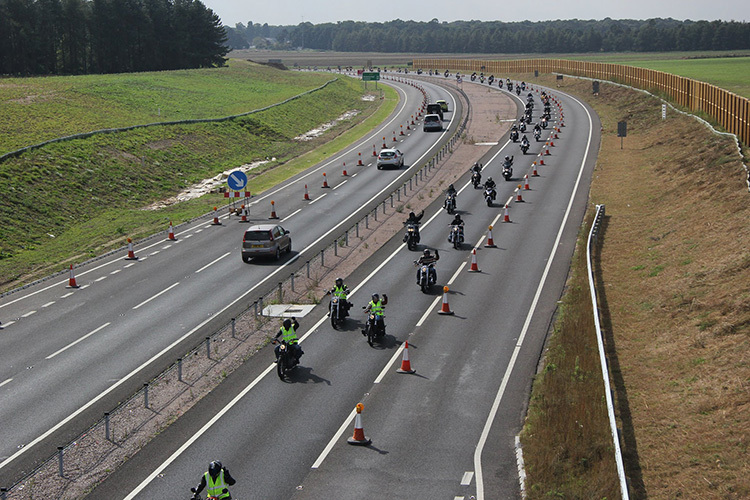 England: Meanwhile as we have previously reported, the planned demonstration by the newly formed A11 Riders Action Group took place on Sunday 14th September 2014. 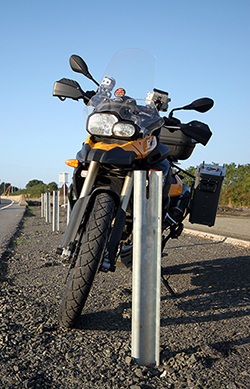 The ultimate aim of the group is to ban the use of Wire Rope Barrier Vehicle Restraint Systems, which are seen by motorcyclists as the most dangerous type of system. 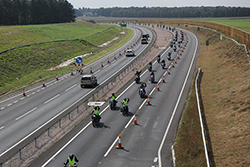 The demo ride concentrated on wire rope barriers which are in the process of being fitted on the A11 project between Thetford and Barton Mills in Norfolk – England. The protest saw more than two hundred riders take part. This action group also has a petition on the Government petition website and has been in dialogue with the Highways Agency, MP, MEPS and ministers. At what point will the DfT (Department for Transport) and Highways Agency prove that these barriers are safe for motorcycles by carrying out tests using a single track vehicle? It has been stated a full safety audit had been carried out for this new stretch of road, was a Motorcycle champion included in that audit, if so who? Can we see the final draft of the audit? The organisers ask riders to ask these questions, or their own of their elected MPs and MEPs. Northern Ireland: The new A8 (Larne Line) Duelling Project is under construction by a consortium of companies, government departments and is funded by various means including- Lagan Construction, Ferrovial Agroman and Costain Ltd. It is co-financed by the European Union Trans-European Transport Network (TENT), Northern Ireland Assembly and the Irish Government. We have just had it confirmed that the vehicle restraint system to be used throughout the centre reserve of the A8 project will generally be the wire rope type. Why are these barriers with their multiple exposed rigid – for a riders body to hit – posts still fitted on our roads when other countries have banned them from being fitted such as Norway, Denmark and the Netherlands? The answer is the European standards (CEN) allow this type of system to be fitted on all of our roads, after testing with other vehicles but not in consideration with motorcycles nor with riders (crash test dummies). This is further compounded in the document “Design Manual For Roads And Bridges Requirement for Road Restraint Systems”. The document describes the procedures to be followed by the various parties involved in the design and provision of various types of Road Restraint Systems and also introduces a risk based framework to support designers in making optimal design choices at specific sites. In our Right To Ride Virtual Research Library, the Crash Barrier page has a plethora documents and videos that identify the dangers and the risks of these wire rope barriers. In the eyes of our roads authorities how many people can be so wrong over so many years? Although in Northern Ireland we are not aware of any impacts by motorcyclists with these wire rope barriers, however the more of them that are fitted the greater the risk that an impact will happen. Perhaps it is time for that factor to be considered more in-depth, before there are any further instalments of wire rope barriers. As a rider what is your opinion of wire rope barriers? No mention from SMC of the Swedish Governments upgrading, replacement and extension of Elk aka Moose fencing. In a reply from Mr Hayes the minister responsible he states that there will only be concrete barriers on Motorways, however its obviously going to be the norm for trunk routes and dual carriageways to have WRB installed. I am trying to get a clear answer on when the old metal barriers reach the end of their life, what are they going to replace them with,its not going to be steel barriers as that would be pointless, so that leaves a couple of options, concrete or WRB, well the DFT have set out their stall on the A11, its a showpiece road improvement and WRB has been installed. This road is going to be fast,anyone who thinks road users will only do 70mph are firmly out of touch with reality. Roadside barriers are meant to decrease the risk of fatality/serious injury,but more importantly stop crossover incidents. Its not only bikers that are at increased risk. A child of 4 would be able to tell you a 44 ton lorry would just go over WRB into oncoming traffic. People can either support the A11 RIDERS ACTION GROUP, but for me as I ride/drive these roads every day, the thought of a cross over incident or a rider being cut in half is not an option I prefer. WRB is banned in Denmark, Norway, France and Holland and indeed Spain had a solution to this danger to road users. So far everyone has been getting the same reply off the highways agency, people need to turn their attention to the minister responsible. We are a free organisation, completely volunteer run, we don’t ask for money, just your support we need…….there has to be a change in policy on WRB but its going to be a long road. However reducing the risk to riders and other road users is something we all agree on, the goal has to be a ban on WRB in the UK to achieve this. Thanks Pat for your comment – unfortunately you don’t seem to have got what the issue of wire rope barriers is all about and you also seem to have fallen into the “trap” that it is the wire rope part of the system that will cause the most horrific injuries when it is most likely the exposed upright posts. Also you have managed to include a totally different issue and mixed it into this issue. You say, “Statistically – how many helmetless riders have been killed by wire ropes ??????? ?” Well the answer would most likely be none – unless there is statistic pre 1973 when the helmet law was introduced. As regards injuries the MAIDS study (ACEM, 2008), states that roadside barriers presented an infrequent but substantial danger to PTW riders, causing serious lower extremity and spinal injuries as well as serious head injuries. There is the potential with all types of barriers to make the roadside less “dangerous” for bikers – unless you disagree! Whatever is on the side of the road is dangerous for bikers. A good rider takes all these matters into consideration and rides accordingly. OK – you could hit oil and be decapitated by a wire rope through no fault of your own. Riding bikes is potentially dangerous. Compulsory helmets does not make it safer. It is safer to ride without a helmet – and be more aware of the inherent dangers. Rider rights groups should focus on this and get the helmet law rescinded. 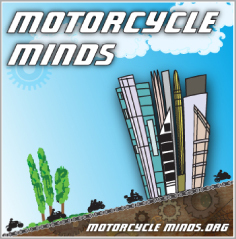 Statistically – how many helmetless riders have been killed by wire ropes ??????? ?